f you own a pub, restaurant, cafe or bar, you’ll know all about how important it is to portray the right image. Image is, after all, everything in business – so if the design and layout of your establishment doesn’t reflect the type of atmosphere you want to create, you could really be missing a trick. From coasters to wallpaper and everything in-between, design is everything – and it is important to consider the design of even the most commonplace and essential components of your drinking or dining space if you want to attract customers. To give you an idea of just how much something as simple as a bar stool can say about your business, and how much they can contribute to its overall style and success; below are 5 of the coolest and most intuitive bar stool designs out there. 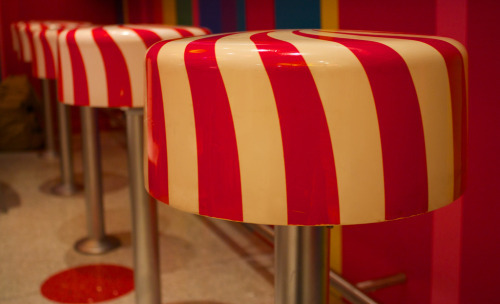 This sort of design is great for a 1950s-inspired diner or cafe, or could be just as suitable in a candy-themed or children’s dining area. Order a cheeseburger, fries and a huge strawberry milkshake, and you’re ready to go! Ordering a Coor’s Light or Budweiser has never been more exciting! If you really want to go the whole hog, take a leaf out of this bar’s book and repurpose something niche and disused that you’re sure will appeal to your clientele. If your place of business has a wildlife or safari theme, or your target demographic is children, then getting a little playful with your café bar stool choices could be a good idea. When sat atop these animal-themed stools, your customers will be transformed into a human-animal hybrid that’s sure to get tongues wagging! If unusual material choices and striking, unique designs are more reflective of your pub or club’s branding, then opting for some perhaps non-traditional bar stools which offer more aesthetic benefits than outright comfort would be ideal. These toughened glass stools in particular are the epitome of designer minimalism. Get creative with your seating choices and invite customers to sit atop a giant bottlecap at the bar! Or you could choose something more closely related to your particular business’ niche, such as coffee cup lids or even sushi roll shapes. The options are endless, really.